People throw around the phrase “deductive reasoning,” but I’m not certain that everyone really knows the true meaning of the phrase. “I looked at other handwriting by the clerk and using deductive reasoning I concluded that the letter that was difficult to read was an ‘M. '” The conclusion that the letter was an “M” may very well be correct, but it wasn’t deductive reasoning that was used. In reading other writing of the same clerk, a pattern may be noticed as to how the clerk makes his letters. Noticing a pattern and then concluding that the pattern always happen is inductive reasoning–not deductive reasoning. Inductive reasoning is a valid form of reasoning–but it involves taking examples, making a rule from those examples and saying that the next time it will happen the same way. Genealogists use deductive reasoning all the time. Deductive reasoning takes specific rules that are known to be always true (or hoped to be always true) or statements made in documents and uses those rules or statements to reach an unstated conclusion. Here’s one simple example of deductive reasoning. The marriage record of Henrietta Newman in Smith County, Illinois, in 1869 has no letter of consent to marry and no notation is made on the record that someone provided consent. Females had to be 18 to marry in Illinois in 1869. Therefore Henrietta Newman was at least 18 on the date of her marriage. The conclusion about Henrietta’s age at the time of her marriage is based upon deductive reasoning. We are using the “rule” about female marriage age, combined with the marriage record, to conclude something about Henrietta that is not on the marriage record specifically. Some would say we have inferred Henrietta’s age or year of birth and others would say the marriage record was “indirect evidence.” I’m not really certain I like the phrase “indirect evidence” and I’m not certain it really matters if that phrase is used or not. What does matter is that we state why we think Henrietta was born in a certain year if the marriage record (and the age at marriage) allows us to deductively conclude that. Henrietta knew her age and did not lie about it in order to marry. If all those statements are true, then Henrietta was at least 18 on the date of her marriage. Whether you use inductive or deductive reasoning, make certain you contemplate the validity of your argument. Inductive reasoning can lead you astray when your ancestor doesn’t really “fit the pattern” after all and deductive reasoning can get you in trouble if your ancestor lied, was unaware of the law, or the clerk was sloppy. 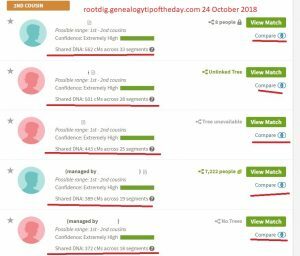 ← Do You Save DNA Match Information?